One of the important current themes in today's world is the importance and power of folks working in small groups. It's not easy to get a group going, keep it going, and so on, given everyone's schedule. There needs to be a book about how to deal with that issue (can cyberspace provide a creative, virtual simultaneity?). Folks like to quote Margaret Mead's statement about small groups--it's so popular it's copyrighted!--but much fewer like to be in small groups. Brings up family? Wouldn't that be important? A small group that meets under the auspices of a church has the implicit intention of fostering spirituality, or creating a spiritually significant context for meeting, discussing, and experiencing aspects of life and embracing its challenges. Individual psychoanalysis used to be the most influential laboratory for such research. There's no way to document the various stories of folks who went on to create/contribute stuff of significance as a result of such self-examination and growth worthy risk taking. Today, perhaps it could be the small group. AA started as a small group experience. I remember taking a small group of my students at Princeton University to meet with a psychoanalyst at the Jung Institute in New York City. It was around 1971. We had started what was the first, for credit, undergraduate course on the topic, "The Experience of Jungian Psychology." We were met with extreme skepticism as to whether or not we could actually accomplish anything of significance since we were not working one on one with a Jungian analyst. We would just get "book learning," not the real "juice." The students picked up on the guy's dismissive attitude and lack of interest in exploring exactly what methods were we using to accomplish our goal. For one thing, we were working with our dreams. We were practicing recognizing "shadow" aspects of ourselves from these dreams. A lot more was going on than mere "book learning." Evolution is requiring that some needed growth processes be freed from narrow contexts and be available in more collective formats. Classes, workshops, and small groups are thriving today. Edgar Cayce and his students, for example, created the A Search for God small group program. It is designed for use outside of any church related context. What would a small group created around Jungian psychology look like? Given Jung's dream approach to understanding the religious instinct, it is not surprising that an important context for Jungian oriented small groups would be the church, and that a dream-oriented process be at the central focus of such a group. I've recently come across a great example of such an undertaking. 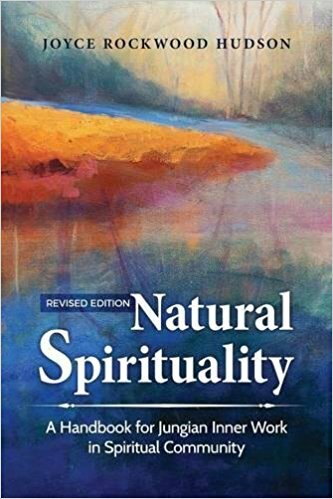 Natural Spirituality: A Handbook for Jungian Inner Work in Spiritual Community, by Joyce Rockwood Hudson, provides a map of the territory that Jungian pilgrims might explore in a church setting. As such, this book functioned well for several years. In the time since then, the author has found that may spiritually oriented groups are forming outside of church affiliation. She reworked her material so that regardless of the context for using the book, the reader would be comfortable in doing so. I think she's done a great job. Of course, I am biased by my earlier experience at Princeton, when we wondered what would be the basic operational requirement of a Jungian oriented group. Our answer was to share dreams and look at the personal shadow aspects. This kind of process is exactly what the author proposes in her manual. I guess we "knew" what we were doing after all. We are not talking about goddesses here, but we do need to point out the importance of the feminine. Jungian psychology sees the planet as mostly ocean with little pieces of land here and there, so that understanding what's in the water becomes very important. The masculine yang aspect of us is quite comfortable dealing with the land, but the water is another story. We learn from the get go that coming to perceive, recognize, value, and relate to the feminine aspect of life will be very important. Dreams and synchronicity become major players. The book covers the territory, leaving it to the reader, and the reader's small group of companions on the journey, as to how they wish to explore the ideas. Talking about the ideas, how each person is relating to them in terms of past experience, is a given. The assumption is that the folks would be sharing dreams. Increasing the number of suggestions on how to explore any particular topic using some form of dreamwork would be a wonderful addition to the next revision of this book. I remember when I first encountered an Edgar Cayce group. Someone told a dream. Then others looked through a collection of Cayce quotes to come up with one that would serve well for the discussion. I introduced the "shadow" practice of the person role playing the symbols in the dream, so there could be some discussion of the experience of that dimension of the dream. Some groups prefer discussions, others prefer experiences, I like to have both hands clapping. To explore Natural Spirituality on Amazon.com, click here! At the leading edge of wise thought in our time, there is a growing awareness that the human race as a whole has grown dangerously one-sided toward the masculine energies of life—toward technology, power, action, and pursuit of the ideal—and that this has come at the expense of the feminine energies of life—nature, process, reflection, and acknowledgment of the limitations of reality. Natural Spirituality: A Handbook for Jungian Inner Work in Spiritual Community – Revised Edition is an expansive guide to restoring the balance of masculine and feminine consciousness to our healthy and whole spiritual life as human beings. Informed attention to dreams and synchronicity is the most natural and direct approach to the feminine divine. And the best way to inform our attention to these naturally occurring elements of spiritual life is through a rudimentary knowledge of the basics of Jungian psychology. This book offers these Jungian tools in clear language and shows how to use them to make sense of our dreams and synchronistic experiences. At the same time, it emphasizes the importance of retaining our connection to masculine consciousness as we take up our new connection to feminine consciousness. Jungian inner work can and must be done individually, but it is also greatly enhanced when brought into spiritual community, whether such a community be situated inside or outside an institutional setting. Natural spirituality dream groups can be formed anywhere—in homes, yoga centers, places of worship, coffee houses, or wherever people of faithful heart and intent might gather. Natural Spirituality as a guide to inner work has enjoyed significant sales for almost two decades. The number of people who are expanding their consciousness to include the feminine divine is steadily growing. For this we can all rejoice, for the goal of human consciousness must be, has to be, that the feminine side of our consciousness be brought into full balance and equality with the masculine side of our consciousness. An intrinsic component of this goal should be that these two sides of our inner and outer reality do not compete with each other but join together in effective union. Collective consciousness changes as a result of cumulative changes in the consciousness of individuals. This book is a handbook for expanding consciousness at the individual level in order to help bring about a much needed expansion of our collective understanding of what human life requires of us in order to be healthy, whole, and in balance with the natural order.